Thanks so much for letting me hijack your blog today, Misha! I always welcome a chance to tell writers about the dojo and how writing as a team can help us be successful. But what is a writing ninja? YOU are a writing ninja. You train until your writing muscles are weary and your brain just can’t take any more. Then you train some more. You often work under the cover of darkness. Slit the throats of your beautiful, drippy prose. Slash pages and pages of useless stuff. And you murder your story. In a totally good way, of course. But while ninjas often work alone, they train in a dojo, with other ninjas who are all working toward the same goal–ultimate skill and perfection. I love National Novel Writing Month. I love knowing I’m slaving away next to other worthy writers. Their presence and commitment keeps me going, pulls me through my dark times and pushes me toward the finish line–that magical place called THE END. But NaNo only comes along once a year, which is really, really sad. When you’re ready to throw some words down, don’t do it alone! Grab a badge (from the dojo page), and add your blog to the Mr. Linky on the dojo page. That way, everyone can know who’s training at the dojo. 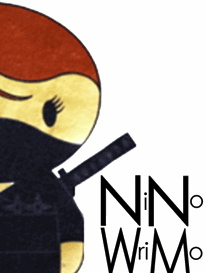 Note: we also have Ninja Novel Revising Month (#NiNoReMo) and Ninja Novel Querying Month (#NiNoQuMo!). Most of the support comes on Twitter as we use the hashtags to find each other and cheer each other along. Also, on Thursdays I host a ninja on my blog who writes about one of five essential skills: Meditation (how you stay grounded), Warm Up/Stretch (how you can get into the mood to write), Forms & Techniques (the nitty-gritty of writing), Kicks & Tricks (those special elements that help take our writing to the next level or how do you reward yourself for meeting your writing goals), and Courtesy (how do you give back to the writing community, or give thanks for the support you’ve received). This dojo is always open. There are always ninjas here to write with you–you don’t ever have to train alone! Join us at the dojo, fellow ninjas! ali cross is the author of the young adult urban fantasy series, DESOLATION. Her first book, BECOME, will be released November, 2011. She’s also the creator and sensei of the writer’s dojo at http://www.ninjaswrite.com and co-host of an online writer’s conference coming February 2012.You can find ali at her blog, and Twitter, Facebook, and Goodreads.